How Much Can You Do In 24 Hours? Visiting any city with only 24 hours to explore is hard enough. But trying to experience all Las Vegas has to offer in 24 hours makes climbing Mount Everest seem easy. All right, so not really, but we’re sure you get the point. 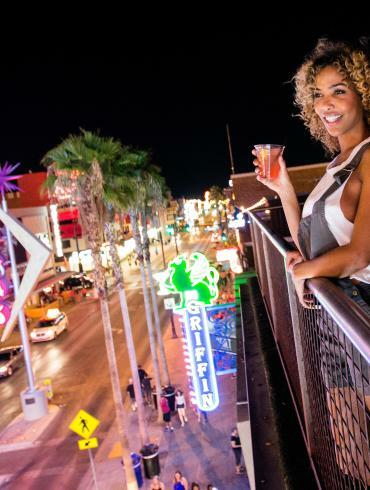 Las Vegas is a city that was built on adult freedom, fulfilling fantasies if you will, and providing low-cost luxury to all − a concept well ahead of its time. But it’s clear that the founders of this city were on to something ingenious as this vision has managed to live on to this day. It’s here where legends such as Dean Martin and Frank Sinatra created a legacy for themselves that helped to build Las Vegas into what is the now the Entertainment Capital of the World. Today, that vision has helped to fuel the growth of Las Vegas. Within only a five-mile stretch on Las Vegas Boulevard, from The Four Seasons to the Stratosphere, you’ll find well over 500 restaurants, 50 nightclub and bars, 25 spas, 30 shows and attractions and of course, a 550-foot observation wheel. Not to mention replicas of the Eiffel Tower, a Roman Colosseum and Egyptian pyramids – typical in all cities, right? So, in a city that never sleeps and offers numerous amounts of activities around every corner you turn, it can be a bit overwhelming to navigate, and exhausting to say the least, especially if you only have one day. Lucky for you, that’s why we’ve created the Vegas Challenge – you’re guide to one day in Las Vegas. Now, we don’t want to lie to you − the challenge will be difficult. Few will complete. But, if you have the energy and the motivation, we’ve laid out a road map for you – hitting all the hot spots. For those who haven’t been to Las Vegas, it may seem simple enough to walk from one end of the Strip to the other. It’s only five miles. But five miles in this city isn’t the same as five miles in another. Your best option to see everything you want to see is to start at one end and make your way to the other. We recommend starting at the Four Seasons and working your way toward the Stratosphere. And please listen to us when we say don’t attempt to walk to every attraction. To start any big day of adventure and sightseeing, you need a good breakfast. Veranda at Four Seasons Hotel is the place to begin. This restaurant features dishes such as s’mores French toast, chicken and waffles, and who can pass on homemade pastries. But, best of all, it’s open by 7 a.m. every day, and to complete this challenge, you’ll need an early start. On the weekends, which are the best time to visit, they turn their restaurant into a buffet and feature a fresh donut machine. How can you beat that? Once you’ve managed to stuff your face, it’s time to move on to your first attraction of the day, the Las Vegas Welcome Sign, which is only a mile south of Four Seasons Hotel. Considering this is the most iconic attraction in Las Vegas, it would be a shame to miss. If you’re not a thrill seeker, then feel free to skip this attraction. But for those who love to feel the adrenaline pumping through their veins, then you have to take a ride on the Big Apple Coaster at New York-New York. At this point, your breakfast has most likely settled, but considering it’s Vegas, why not take your chances. At this point in your day, it should be around noon, although it’s not yet time for lunch. Next up in the challenge, the famous Fountains of Bellagio, considerably the most “Instagrammed” location in Las Vegas. Be sure to watch the fountain show that sends water soaring 460 feet into the air, but only if you’re there on a weekend. On weekdays, the show starts at 3 p.m., and take lots of pictures. But don’t leave Bellagio before checking out the Conservatory and Botanical Gardens. This beautiful seasonal display changes with the holidays and always offers a new setup with the passing years, so you can be sure that no matter how many times you visit it, you’ll never see the same scenery twice. To continually preserve something this grand and spectacular, it takes a total of 120 employees to maintain year-round. Clearly, all the effort must be worth something. A little ways farther down the Strip, you’ll find the Flamingo, one of the oldest hotels on the Strip and an iconic attraction none the less. It’s here that we recommend you check out the flamingos living in the Wildlife Habitat. That’s right. Who would have thought that at the Flamingo there are actual flamingos? Don’t leave Bellagio before checking out theConservatory and Botanical Gardens. This beautiful seasonal display changes with the holidays and always offers a new setup with the passing years, so you can be sure that no matter how many times you visit it, you’ll never see the same scenery twice. Now, it’s time for lunch. Across the street from the Flamingo, within Caesars Palace, you’ll find one of the best buffets in Las Vegas, Bacchanal Buffet. It just wouldn’t be a trip to Vegas without trying one of its famous buffets. While you’re there, be sure to eat enough as dinner is a while away on this challenge. Once you’ve finished eating, why not do a little shopping or sightseeing at The Forum Shops at Caesars, whichever you prefer. Inside, you’ll find 160 stores, Roman statues, a replica of the Trevi Fountain, The Fall of Atlantis fountain show, and a sky-painted ceiling that gives the illusion it’s always daytime. It’s best to go back to your room at this point and change into nighttime attire. But don’t dare take a nap. If we haven’t lost you yet and you’re determined to complete this challenge, then next up you have to visit the Chandelier Bar at The Cosmopolitan of Las Vegas. It’s one of the most stunning bars on the Strip − a three-story bar surrounded by dangling chandelier crystals is something you won’t find anywhere else. While there and if you’re interested in trying something new, be sure to taste the Verbena cocktail. It will leave your mouth feeling numb. After a drink or two, or three, it’s on to dinner at Giada De Laurentiis’ namesake restaurant, Giada’s at The Cromwell. Because what trip to Las Vegas would be complete without dining at a celebrity chef’s restaurant. If you have time before dinner and want a photo opt, be sure to make a stop at the Eiffel Tower at Paris Las Vegas. It’s almost as tall as the real one in Paris. Ready to see the whole city? Our next attraction allows you to do just that. The High Roller Observation Wheel, situated in The LINQ Promenade, offers a 360-degree view of the city from 550 feet in the air. An entire rotation takes 30 minutes. Right about now, you’re probably exhausted. But if you can manage to keep going, the best is yet to come. To begin the nighttime fun, start your night at The Label at The Palazzo. It’s a lounge that’s sure to bring you back to the golden age of Las Vegas, with nightly live jazz music and signature drinks dedicated to Frank Sinatra. We realize not everyone is up for a Las Vegas nightclub, which is why we’ve provided you with two options for the next challenge item. You can either live it up at XS Nightclub inside Wynn Las Vegas, one of the top-five highest grossing clubs in the United States, or see the longest running Cirque show on the Strip, Mystère. Both are sure to leave you speechless. If you’re looking for some midnight munchies after the club or the show, 800 Degrees inside SLS Las Vegas cooks you your own personal pizza, complete with all the toppings you want. Last on this list is a little bit of gambling at the Stratosphere because what trip would be complete without leaving this city trying to win a few hundred dollars. 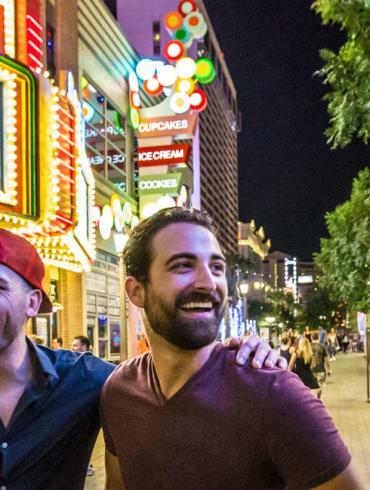 So, there you have it, all the hot spots to hit if you only have one day in Las Vegas. Are you up for the challenge?